North and South County agencies are vying for Homeless Emergency Aid Program (HEAP) funds that have been given to SLO County by the state in order to address homelessness. The respective agencies are seeking to construct shelters in Paso Robles and Grover Beach. The Grover Beach project contains plans for permanent affordable housing, in addition to a warming center for homeless individuals to sleep in during the cold months of the year. The 5 Cities Homeless Coalition and People’s Self-Help Housing are partnering on the Grover Beach project, which is located on the Hillside Church property, a 3.1-acre lot at 1935 Newport Avenue. If constructed, the homeless shelter would have 11 youth dorm-style rooms with up to 44 beds, an administration office and a case management office. The shelter would be managed by the 5 Cities Homeless Coalition and would have an on-site manger. Meanwhile, plans for the second phase of the project call for People’s Self-Help Housing to construct 20 permanent homes for residents whose earnings are at or below 30 percent of the median income. The permanent housing would also include an on-site manager’s unit. The city of Grover Beach has offered its support for the project, and city officials have indicated they would support a zoning change for the area from single-family residential to mixed use. However, a group of local residents is opposing the project. A group called Neighbors for Safety says the shelter would be too close to schools and create safety concerns because it is located in a residential neighborhood. 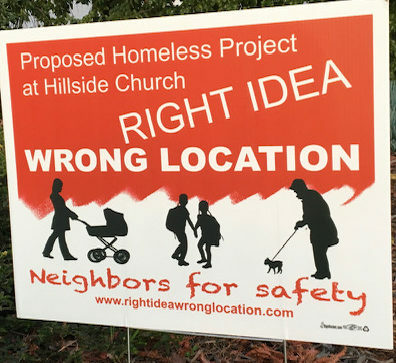 Neighbors for Safety says the idea of the project is right, but the location is wrong. Have to wonder how the Arroyo Grande City Manager was approved to speak at a Grover Beach council meeting to state the city of Arroyo Grande is in support of the shelter project when the item has never been on any Arroyo Grande council agenda, the residents of AG have never had the voices heard, and there has never been a public vote by the AG council. Is this a self appointed city manager taking it upon himself to state a city opinion or was he given the okay by Mayor Ray, who took it upon herself to decide the city’s opinion?